Several sports-themed films in the 22nd San Francisco International Asian American Film Festival deserve mention for their original themes and captivating footage. When a white or "haole" (pronounced "howly") arrogant surf champ David, portrayed effectively by Scot Davis, nearly dies in a surfing accident, he’s sent back in time, where he befriends Duke Kahanamoku before the Hawaiian athlete became a surf legend. Once the cocky surf champ develops feelings for the land and its people, he learns the true meaning of surfing from Duke, how to surf from the heart, and on ancient longboards, no less. Mary Paalani plays Lehua with a quiet conviction as she dares to fall in love with David the "haole." Sean Kaawa's natural performance as Kahanamoku overcomes the film’s simplistic script. Although a traditional romance, there’s plenty of beefcake. Sean Kaawa is simply stunning as the hapless, muscular Duke. Weldon Kekauoha as Blackie, and Johann Bouit as Caps, round out the cast with their husky charm, and a lot of Hawaiian slang. All the men do most of their own surfing, adding authenticity to this cute and sweet historically fictional, but culturally respectful, film. This one-hour documentary by Bay Area filmmaker Sapana Sakya tells the perilous yet heartwarming story of a group of women who, for diverse personal reasons, decide to be the first female team to hike the summit of Mount Everest, the famed peak in the Nepalese Himalayas. Over 150 people have died in attempting the climb. The only woman to successfully climb Mount Everest died on her descent. Statues in Nepal commemorate the fallen hero. 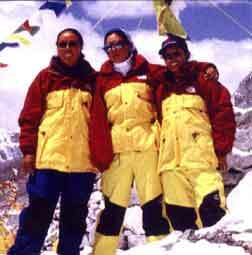 To overcome the limitations of impoverished Sherpa women, for whom becoming high altitude guides (the most lucrative of jobs) is limited to men, Mimgma leads the team. "We're climbing Everest to prove that women are no less than men," she says. All participants offer insight through the film, with a lot less external drama than the hyped up "Survivor" TV show, but with meaning that is much more profound for its participants, all native Sherpa Nepalese. The women get equipment from sponsors proud of their efforts. But their three-week training period gets pushed ahead of schedule so that the climb coincides with Nepal’s millennium celebrations. The pressure mounts through press conferences, meetings with the king and queen of Nepal, and ceremonies with Buddhist monks and the Prime Minister. Yet, their team leader is remote and the group hasn’t cohered. After a few days at base camp, and visits to a cherished mountain monastery for blessings from the lama, they begin what is often a six-week journey. They make the journey in less time, but the sacrifices made on the way up show a surprising finish. 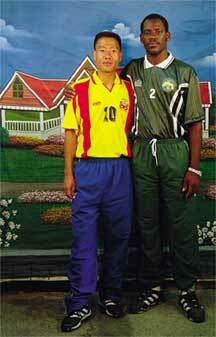 Montserrat and Bhutan, the two lowest ranked soccer teams, were asked by a representative from the Dutch team to play a smaller more intimate final as the global media focused on the 2002 World Cup in Japan. Clever segues using a globally bouncing soccer ball keep the tone light, but one can’t help but feel the touching enormity of the gesture, bring two disparate cultures together for a dignified losers’ match. A sense of humanity, and the distinct culture of each team, is beautifully shown. Monteserrat’s main sport is cricket, and its ranks of soccer players remains at 150, yet their supporters keep high goals. Still recovering from the devastation of a 1997 volcanic eruption that took place on the small island off the coast of Brazil, the Montserrat players even have to delay soccer practices when the air carries a thin layer of remnant ash. Bhutan, with up to 900 team players, is seen fascinated by the World Cup, and soccer, which is taught in impoverished schools. TV sales jump before the event in the small sovereign country in the Himalayas. Even the former king was a highly ranked goalkeeper. One interviewee the goal of achieving "Gross National Happiness," and sees sports as a venue for interaction and achievement. The affable story is complicated when both teams lose their coaches. The Montserrat team has difficulty acclimating to the mountain air, and suffers from travel sickness. A montage of global media derisively calls it the worst FIFA soccer match, but the players keep their dignity, and make the eventual victory a bipartisan affair, particularly with the creative use of the trophy. An historic time in the often forgotten history of World War II North America, when Japanese-American citizens were locked up in camps, even includes sports as a form of vindication. ‘Sleeping Tigers’ traces the history of Vancouver immigrants, their love of baseball, and how one team made history by taking on non-Asian teams outside their community. Their success was abruptly cut short with the outbreak of WWII, and Japanese Canadians were shipped off to hastily formed work camps in the far reaches of rural British Columbia. 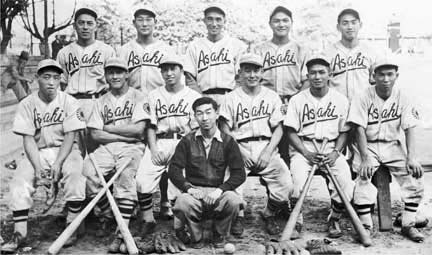 To pass the time of their unjust wartime imprisonment of entire families, their homes and belongings sold or confiscated, many young men, some from the Asahi team, started playing organized baseball games. "It had a feeling of, ‘Let’s show ‘em,’" says one interviewee. "’Let’s show ‘em they can’t keep us down.’"
Surviving players in their 80s are interviewed. Vintage and recreated footage, plus lots of archived photographs, recalls the quietly revolutionary team, and the recent tribute the surviving members receive at a Toronto Bluejays game. Accompanying the screening of Sleeping Tigers is Day of Independence, a short film that tells a similar story of U.S. Japanese internment camp baseball players. What’s surprising is how the characters focus more on socializing and doing their best to enjoy their lives during this often ignored era in our past. For ticket and theatre info, pick up a schedule, or visit The Festival Web site. All articles copyright Jim Provenzano/Bay Area Reporter. Do not copy, post or link without written permission. Most images copyright Jim Provenzano, unless used in an editorial context.